Stop the presses. We'd like to take a moment to express our appreciation to our subscribers and other financial supporters. We do it every day when we sit down at the keyboard but once a year we like to make a public display of our gratitude. First Apples. A gift from a neighbor, the tree is starting to produce fruit. Many of you have been with us since 2012 when we started this publication. Even more of you have found us since then, swelling our monthly pages views over the million mark on several occasions. Subscriptions remain our leading means of support followed by our affiliate links and donations. CPM advertising remains a mystery to us but we'll figure it out eventually. Still, nothing really approaches the boost subscriptions (which are tax deductible for businesses in the field) provide. 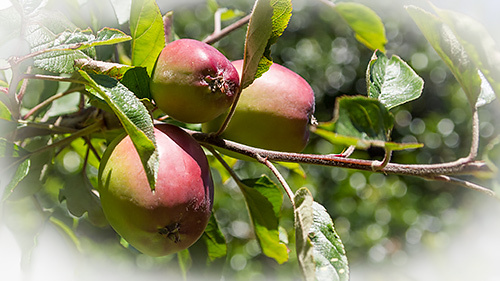 The image accompanying this thank-you card is of the apple tree in the yard outside the bunker. A neighbor with a lush yard himself grew it from seed a few years ago and, having no spot in his own yard for it, gave it to us a few years ago. We pruned it, watered it, weeded it and this year it sprouted three blossoms that have dutifully turned into apples. It strikes us as something like a miracle. Much like your support. Thank you.